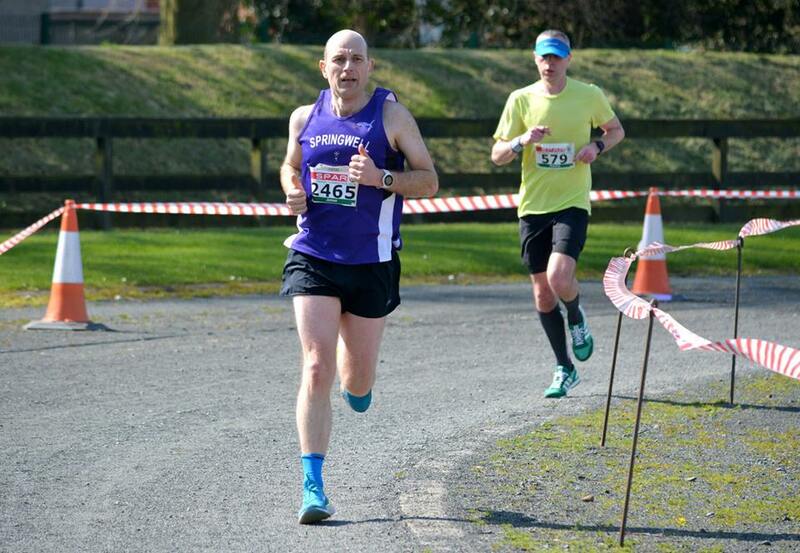 This week has seen Springwell runners in action at the highly competitive Queens 5k and the very popular Omagh Half Marathon, as well as appearances at Marathons in Ibiza, Rotterdam and Manchester and a run along the River Foyle. The Deep River Rock Queens 5k Race Around the River took place in very wet and windy conditions on Wednesday 3rd April. The race was this year’s NI & Ulster 5k Championship event, ensuring some quality performances from the 800 athletes in attendance. The race started at 7.30pm on the Annadale Embankment and from the start a group formed who would eventually decide the podium positions. After a close two laps, it was Neil Johnston (Springwell RC) who finished 1st in a time of 14.51, securing the NI & Ulster title for the second consecutive year. He was closely followed by Declan Reed (City of Derry Spartans) in a time of 14.58 with Chris Madden (City of Lisburn AC) completing the podium in a time of 15.02. NI & Ulster Senior XC Champion, Mark McKinstry (North Belfast Harriers) just missed out on a podium spot finishing in 4th position in a time of 15.04 with Conall McClean (St Malachy’s AC) coming in just behind him in a new PB time of 15.05. In the Ladies event, Nikita Burke (Letterkenny AC) added to her week after a triumphant 3rd place at the TQ10k on Sunday 31st March, to take 1st place and the NI & Ulster title in a time of 16.50. Following her was World Masters Champion, Kelly Neely (City of Lisburn AC) in a time of 17.06 and Sarah Lavery (Beechmount Harriers) in a time of 17.07. NI & Ulster Intermediate XC Champion, Ciara Toner (Springwell Running Club) finished in 4th place in a time of 17.11, closely followed by Jessica Craig (North Down AC) in 5th place in a time of 17.18. The 5k River Rescue Run, organised by the North West Regional College in aid of Foyle Search and Rescue took place on Thursday 4th April. The race started at 7.30pm from the clock tower in Ebrington Square and took runners on an out and back course along the River Foyle before crossing the Peace Bridge to finish on the embankment opposite the Guild Hall. In the ladies race Springwell RC’s Catherine Pinkerton had an excellent run to finish second with a time of 21.33 and Ryan Kennedy won his age category, finishing 11th overall in 20.06. The 30th Omagh Half Marathon, organised by Omagh Harriers took place on Saturday 6th April in perfect running conditions of clear blue skies and gentle breezes. Starting from the Towns leisure centre this year’s race was one of the most competitive with current Irish Marathon Champion, Gary O’Hanlon (Clonliffe Harriers) and current NI & Ulster Cross Country Champion, Mark McKinstry (North Belfast Harriers) matching each other stride for stride until the final stages of the race. At the finish it was Gary who claimed victory in a time of 1.07.40 with Mark second in 1.08.40. Eoin Hughes (Acorns AC) completed the podium with a tie of 1.10.46. In the ladies race Laura Graham (Mourne Runners) followed up her victory at the Larne Half Marathon with another convincing win, crossing the line in 1.16.31, over four minutes ahead of second placed Martina McGee (Tir Chonaill AC). Karen Alexander (Unattached) finished in third in a time of 1.21.26. Springwell RC Results - 33rd Aaron Moffatt 1.20.21 PB, 118th James Stewart 1.27.22, 134th Jeff Young 1.28.05 PB, 149th Warren McIlmoyle 1.28.45, 154th Chris Holmes 1.29.04, 166th Maurice Walker 1.29.21, 170th Stephen Fillis 1.29.31, 286th Karen McLaughlin 1.34.38 (3rd F45), 350th Timmy Bacon 1.37.03, 351st Gary Moore 1.37.04, 510th Brian Merron 1.41.29, 646th Barry Mc Cluskey 1.44.47, 871st Eugene McCabe 1.49.55, 887th Mervyn Thompson 1.49.29, 919th Paul Irwin 1.51.17, 1133rd Elizabeth Deighan 1.55.43, 1293rd Lorraine Mullan 1.57.20, 1585th David Campbell 2.05.26, 1621st Laura Wilson 2.06.31, 1659th Colin Connolly 2.07.39, 1672nd Mariette Mulvenna 2.07.59 PB, 1673rd Paul Dornan 2.07.59, 1888th Andrew Kincaid 2.14.10, 1891st Ingrid Hamilton 2.16.02, 1921st Alison Duncan 2.15.02, 1017th Andrew Wilmot 2.19.54, 2123rd Kate McNicholl 2.27.55, 2124th Caitriona Mackle 2.26.21, 2231st Jonathan Lynch 2.36.10. This weekend saw three Springwell RC members on their travels, taking part in Marathons in Ibiza, Manchester and Rotterdam. In Ibiza Alison McAllister finished in 550th in a time of 5.13.18 while in Manchester, Alan Nevin ran a 3.26.12 to finish 3329th. In Rotterdam, where the temperatures reached 20c, Julie Millican finished 8176th with a time of 4.19.57.